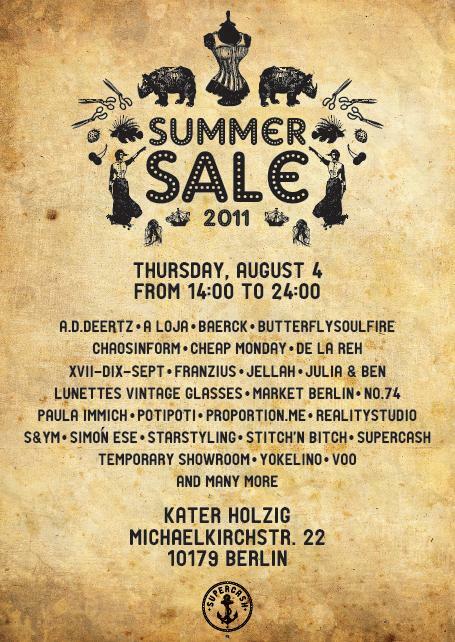 S&yM are taking part of Super Cash Summer Sale in Berlin on August the 4th! On the grounds of the new down by the river spot Kater Holzig the summer sale of Super Cash will take part with numerous of labels/shops/projects and great minds coming together this coming thursday from 14.00 - 24.00 Uhr! Come down to us and say hi and see how we turn passed time into future, hence we present our great vintage collection! With branded labels, no named one-offs and our outstanding vintage music tour T-shirts! How marvelous introductions can be..
new |n(y)oō|adjective1 not existing before; made, introduced, or discovered recently or now for the first time. genesis |ˈjenəsis|noun [in sing. ]the origin or mode of formation of something : this tale had its genesis infireside stories! We would be delighted by your presence and appearance!